Error code 0x80071a90 can arise due to a myriad of reasons. For many users, the error code appears when trying to install the .net framework in Windows 10. 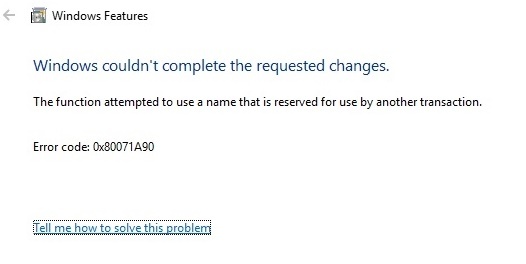 The error code is often followed by a message that, “The function attempted to use a name that is reserved for use by another Transaction”. The error can also arise when trying to add the Hyper-V feature in Windows 8 and 10. Fortunately, you can rely on several methods to fix the issue. The code will scan the protected system files, and any corrupted files will be replaced with a cached copy that is located at %WinDir%\System32\dllcache in a compressed folder. The process should continue until it is 100% complete. It should display a message that it has successfully repaired the corrupt files. It means that the process has been completed successfully, and the error code 0x80071a90 will be resolved. In some cases, you might get the message that the tool has not been able to fix the corrupted files. In this case, go to the directory of the corrupted files, and replace the file manually with the right copy. If the process is followed by the message that the tool has been unable to perform the requested action, then you will have to run the tool again in safe mode. You should also check that the PendingRenames and PendingDeletes folder is located in the %WinDir%\WinSxS\Temp directory. If you get the error message “Windows Resource Protection did not find any integrity violations” then it would mean that the tool did not find any corrupted files. In this case, go to the second method below. If the error arises when you are trying to install the Hyper-V feature and you are using the Avast antivirus program, then you can easily resolve it by turning off your antivirus and shutting down any software that might be using the virtual machine. You can disable your antivirus by running it and choosing the Disable option. Please refer to the manufacturer website on specific ways of disabling it. Restart your computer. Press the F8 key while it is booting up. The key differs with every Motherboard manufacturer. Select “safe mode” and boot up. Some third party software can affect your computer. The safe mode will disable all third party software. If the issue does not occur in safe mode, then you can try to disable your security software and close any third party software or background apps that are currently running when you boot into normal mode again. The 0x80071a90 error code will then be resolved. You can also resolve the error code through a clean boot. To do a Clean boot, you must follow below mentioned steps. First, you should disable all third party services. Right-click on the task bar and click on task manager. Click on “more details” and select the startup tab. Next, disable all the applications that are enabled on startup. You can click on the application and click on disable, or right-click on the application and select “disable”. The system configuration window will open. Select the services tab. Check to hide all Microsoft services, and then disable all services. You can then restart your computer, and the error code will be resolved. Press the Windows key + X, and select the control panel. On the option to troubleshoot computer problems, click on system and security. Click on Windows Update that it located under Windows. Click on advance and select run as administrator. Press next while following the onscreen guide to troubleshooting the issue. Trouble shooter doesn’t work always but many a times it proves to be useful and fixes any errors that users are facing. So, Run it and see if this helps to fix error code 0x80071a90. To conclude, error code 0x80071a90 often occurs when trying to install windows features. 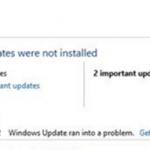 The error code is common on Windows 8, 8.1, and 10 users. The error arises from various issues within the system such as corrupt files or third party services. However, it can be easily fixed by several methods such as using the troubleshooter, a clean boot, disabling antivirus or checking for file and system errors. How you doing, I have tried your all methods they actually work well.